The Minister of State for Culture (Independent Charge), Tourism (Independent Charge) and Civil Aviation, Dr. Mahesh Sharma writing his impressions in the Visitors Book, at the Asian Civilisation Museum, in Singapore on June 18, 2015. 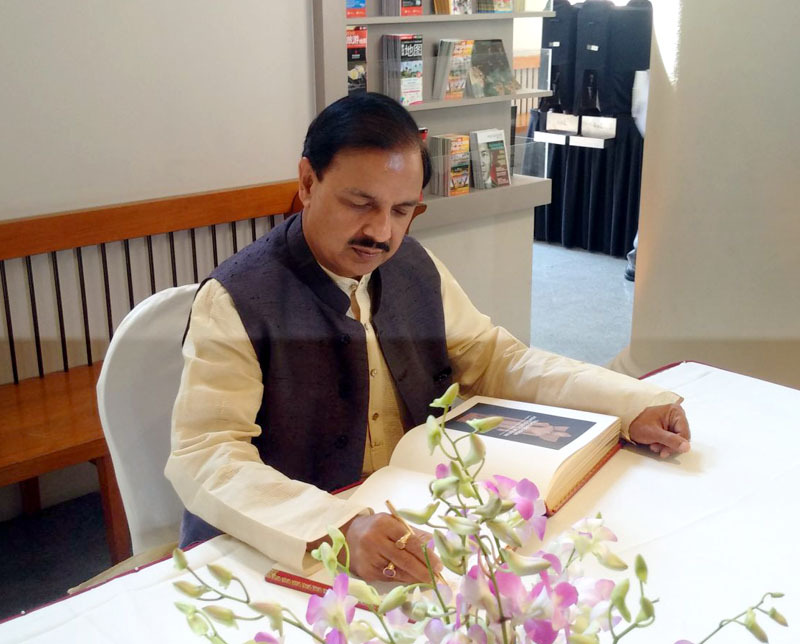 The Minister of State for Culture (Independent Charge), Tourism (Independent Charge) and Civil Aviation, Dr. Mahesh Sharma releasing the catalogue, during the opening of Buddhist exhibition, at the Asian Civilisation Museum, in Singapore on June 18, 2015. 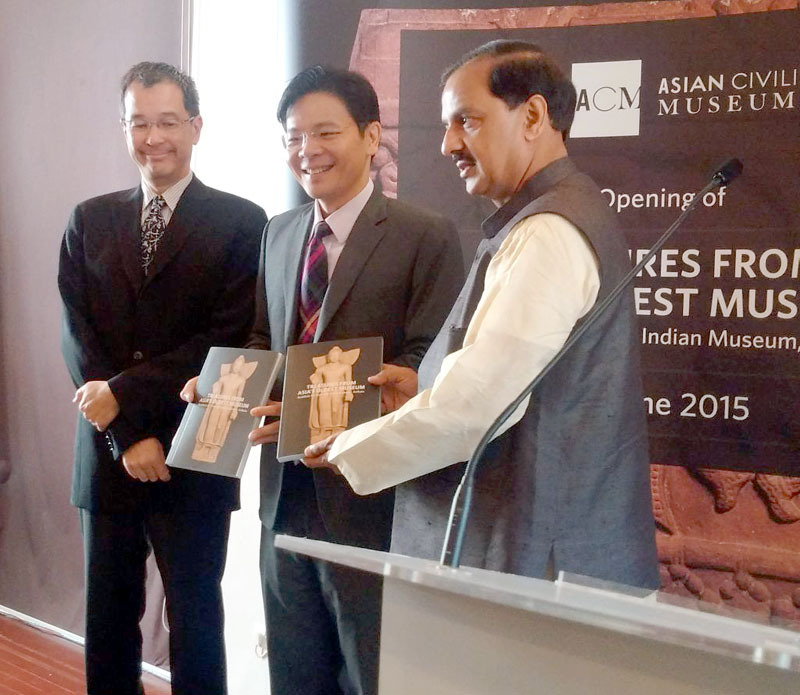 The Culture Minister of Singapore, Mr. Lawrence Wong is also seen. The Minister of State for Science and Technology and Earth Science, Shri Y.S. Chowdary releasing the Knowledge Paper at the inauguration of the 4th National Conference on Climate Change, in New Delhi on June 18, 2015. The Vice President, Shri Mohd. 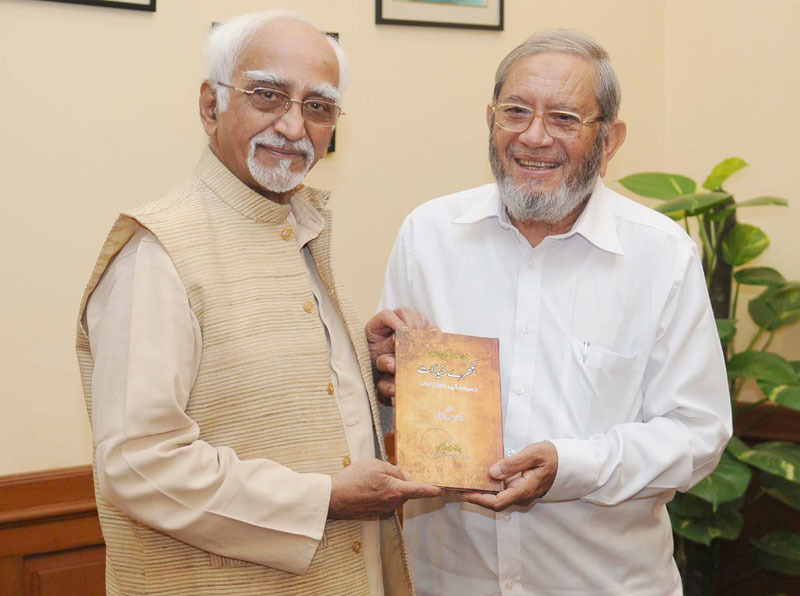 Hamid Ansari being presented a book entitled “Bikhare Khyalat”, by Prof. Abdul Haq, in New Delhi on June 18, 2015. Ms. Maryam Asif Siddiqui, winner of Bhagavad Gita Champion League, accompanied by her parents, Shri Asif Naseem Siddiqui and Smt. 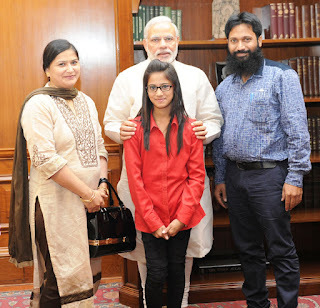 Farhan Asif Siddiqui, meets the Prime Minister, Shri Narendra Modi, in New Delhi on June 18, 2015. 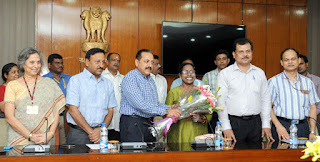 The Minister of State for Development of North Eastern Region (I/C), Prime Minister’s Office, Personnel, Public Grievances & Pensions, Department of Atomic Energy, Department of Space, Dr. Jitendra Singh felicitating to Ms. N.L. 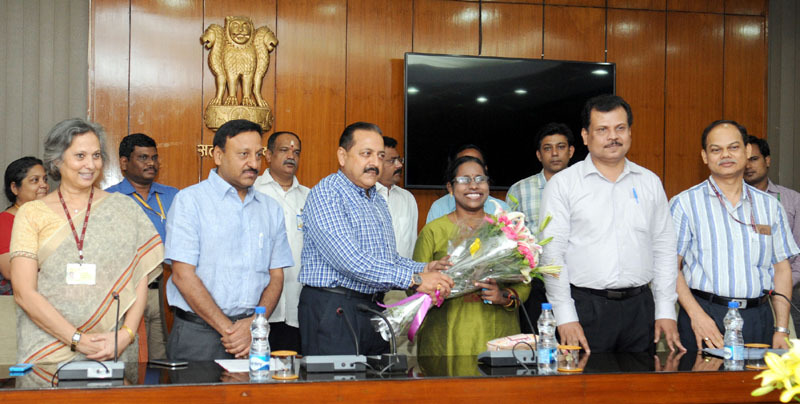 Beno Zephine (visually challenged) allocated to the Indian Foreign Service-2014, in New Delhi on June 18, 2015. The Union Minister for Agriculture, Shri Radha Mohan Singh launching the Web-portal “Crop Insurance”, in New Delhi on June 18, 2015. 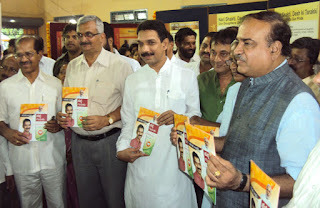 The Ministers of State for Agriculture, Dr. Sanjeev Kumar Balyan and Shri Mohanbhai Kalyanjibhai Kundariya is also seen. The newly commissioned nursing officers of the Military Nursing Service with the Commandant, AH (R&R), Lt. Gen. M.K. Unni, the Additional DG, Military Nursing Service, Maj. Gen. Sunita Kapoor and other senior officers of the Army and the MNS, at the Commissioning Ceremony of the 56th Batch Probationer Nurses, in New Delhi on June 18, 2015. 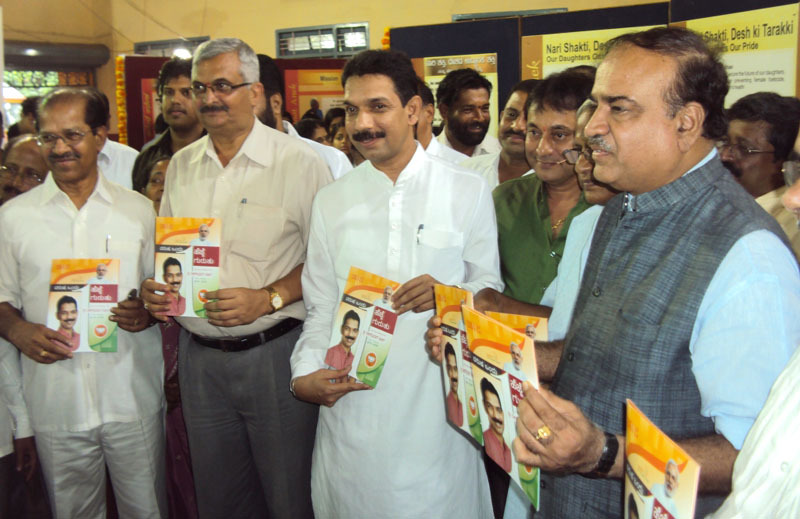 The Union Minister for Chemicals and Fertilizers, Shri Ananth Kumar releasing the booklet at the inauguration of the DAVP exhibition ‘Saal Ek Shuruaat Anek’, in Mangalore, Karnataka on June 18, 2015. The Member of Parliament, Shri Naleen Kumar Kateel and the M.L.A., Mangalore, Shri S.R. Logo are also seen.